HÉBERT, Felix Edward, a Representative from Louisiana; born in New Orleans, Orleans Parish, La., October 12, 1901; attended public and parochial schools, Jesuit High School, New Orleans, La., and Tulane University, New Orleans, La., 1920-1924; engaged in newspaper and editorial work in New Orleans, La., 1918-1940; colonel on staff of the Governor of Louisiana in 1936; served as personal representative of the Governor in Washington, D.C., in 1940; elected as a Democrat to the Seventy-seventh and to the seventeen succeeding Congresses (January 3, 1941-January 3, 1977); chairman, Committee on Armed Services (Ninety-second and Ninety-third Congresses); was not a candidate for reelection in 1976 to the Ninety-fifth Congress; resided in New Orleans, La., where he died December 29, 1979; entombment in Lake Lawn Park Mausoleum. Hébert, Felix Edward, with John McMillan. 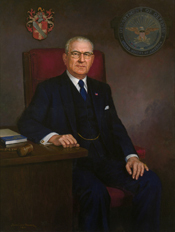 Last of the Titans: The Life and Times of Congressman F. Edward Hébert of Louisiana. Edited by Glenn R. Conrad. Lafayette, LA: University of Southwestern Louisiana, 1976; Conrad, Glenn R. Creed of a Congressman: F. Edward Hébert of Louisiana. Lafayette, LA: University of Southwestern Louisiana, 1970.